As with all other art, you should try to buy the sculpture that you like and not what you think other people will like – this is because (presumably) you will be the one who is living with it and we are always happier living with what we like! In our experience, fine sculpture is often far better value than paintings in terms of the importance that you can buy for a given sum of money. It is still possible to buy interesting and sometimes very desirable works by quite important sculptors of all periods (but especially from the 17th, 18th and 19th Centuries) for relatively modest sums, especially when compared with equivalent 20th Century and Contemporary paintings. Wherever possible, try to buy original sculpture that has been worked by the hand of the sculptor or created under their close supervision. This authenticity can usually be confirmed by visual analysis of the work (assessing its form, material, surface, inscriptions etc.) and by reference to appropriate art historical research by an established art expert or professional. In the case of bronzes, one should attempt to buy high-quality casts or (from the 19th century onwards) multiples or limited editions from foundries authorised by the sculptor. Before buying, thoroughly inspect and look out for possible restoration work, especially of the nose, fingers and other extremities that could have broken off or been replaced. Repairs and damage might not necessarily stop one from buying a piece, but it may reduce the value. 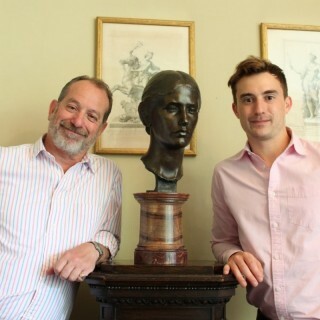 Interesting and early provenance may not always be available, but it often enhances the attractiveness and value of a sculpture, so it is always worth finding out as much as possible about the history of an object. In general, most sculpture looks best displayed at eye level and some sculpture (especially larger-than-life size busts) only looks right from below. Bear this in mind when thinking about the height of plinths or shelves used for displaying your sculpture. Finally, with medium to large sculpture, never underestimate how heavy it can be! Make sure all your sculpture is displayed in a position where it cannot easily fall or get knocked over, and leave it in the hands of professional art handlers or shippers to transport or move larger pieces safely.